Exclusive Beach Colony is located on 11 acres of fabulous beachfront. The ingenious angular living room design transforms every residence into a corner unit. Wall-to-wall sliding doors and adjoining windows actually wrap around the living room, filling it with light, and revealing the panoramic beauty of the Gulf. The sweeping 300 SF terrace will be a favorite spot for quiet moments and lively gatherings alike. The uniquely situated Master Bath is a world unto itself. The whirlpool bath is surrounded by large, wrap-around windows, which can open to offer both a view and a feel of the hypnotic Gulf. 1497 SF with Tiled Foyer, Kitchen, Living and Dining and Baths. Bedrooms are carpeted. Very friendly staff, communicated with my husband and I during booking and checking on us as we traveled to make sure we arrived safely. 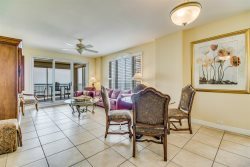 Beautiful Condo, very spacious and relaxing with a perfect view of the beach! My family will be booking again for our future vacations. Very friendly and accommodating staff . Indeed a welcoming pleasure !! !